With the Rocket Burner® as the dynamic core, MHG Heiztechnik was already marketing a perfectly coordinated oil heating system in the nineties, under the EcoStar brand name. This high-tech unit is now on the market in its second generation. With the oil-fired condensing boilers the low-temperature version combined with a downstream heat exchanger, or the simple low-temperature model, we have a range of premium products that leave nothing to be desired. In the new EcoStar model series (15 to 62 kW), MHG Heiztechnik offers premium technology for optimum economy, eco-friendliness, convenience and safety. The sophisticated, high-quality components – Rocket Burners®, compact cast-iron boilers of German manufacture, high-performance exhaust heat exchangers, convenient control systems and hot water storage tanks – all add up to make a perfectly coordinated oil heating system for use in houses and apartment blocks. There are a large number of different output and equipment versions of these oil fired condensing boilers to choose from. All the versions are approved for operation with low-sulphur heating oil. A particularly low level of operating noise, excellent reliability and minimal maintenance costs underpin the outstanding attractiveness of the EcoStar oil unit. 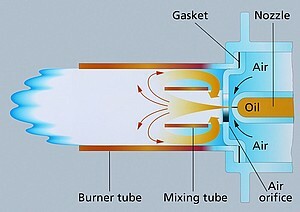 Rocket Burner Soot Free Mixing System.